FORD'S flagship hot hatch, the Focus RS, has come in for a final tweak as it nears the end of the German production line. Just 500 examples of the limited edition RS are heading to Australia. If history is a guide, once they're gone there will be vacant space in Ford showrooms for at least another five years before the next-generation Focus RS arrives. That may be one reason the price has risen by a whopping $6000 - more than 10 per cent - from $50,990 plus on-roads to $56,990. Ford is in no rush to sell them. Another reason for the price hike is extra equipment such as lightweight alloy wheels, stickier and wider Michelin tyres, limited-slip front differential and even more aggressively bolstered racing-style seats. Trainspotters will also note the black mirror caps, roof and end plates on the rear wing and the RS logos in the centre caps of the wheels. Automatic emergency braking - which can slam on the brakes at suburban speeds if the driver is not paying attention - is also now standard. Ford will no longer import the regular Focus RS, so it's this new expensive limited edition - exclusively in bright blue - or none at all. There's no more power from the 2.3-litre turbo (257kW/440Nm) and the claimed 0-100km/h time is, as before, 4.7 seconds. In an earlier road test we couldn't match this even when using launch control. Not wishing to fry the clutch, we did no better than 5.2 secs. 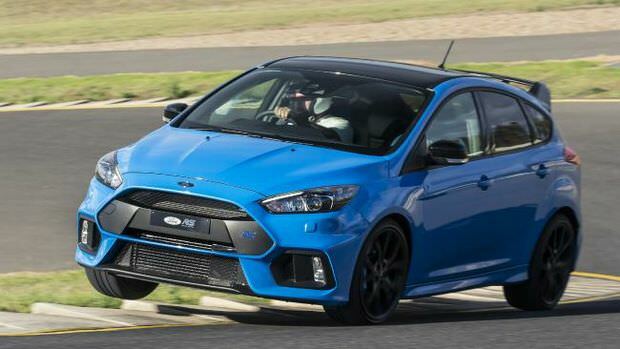 The Focus RS is more about how the car feels once on the move. In second and third gear the acceleration is brutal, with gear changes announced by a crackle from the exhaust. Ford engineers had to add the aural enhancement. The fireworks use a smidgen of extra fuel, though the RS is a thirsty machine anyway.